Trade Show Banner Stands are Great for Indoor and Outdoor Events! Our huge selection of trade show banner stands includes retractable banners, outdoor event flags, hanging banners, and much more. Trade show banner stands offer a great way to get your products and services attention at marketing and promotional events. Since these events usually involve travel, our trade show banner stands are designed to be lightweight, portable and easy to assemble. Each banner stands is compact for transportation, but provides you with a large area to display graphics, logos, and other images. 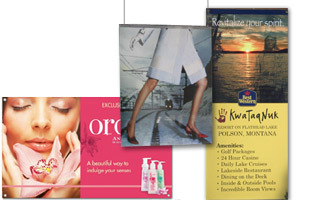 Trade show banner stands are useful for a variety of applications and functions. They can be placed anywhere you'd like, and require very little floor space. Trade show banner stands, also known as graphics displays, can be placed at the entrance of an exhibit booth to entice people to inquire about your business. 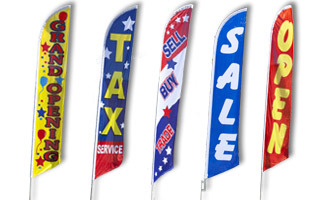 Banner displays are also great for retail environments, sports venues, concert halls, and more. We sell most of our trade show banner stands with custom printed graphics for a big visual impact. Use portable displays, exhibition stands and other trade show banners stands to promote brand awareness and make a lasting impression on your customers. 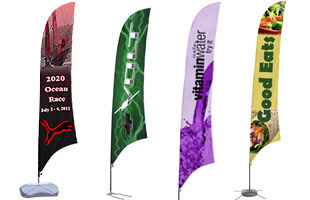 Banner stands, such as retractable banners or event flags, are perfect for a many applications other than trade shows. These trade show banner stands are also great products for stores, restaurants, lobbies, and sporting events. 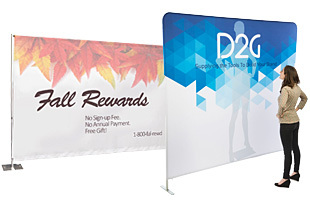 Use a banner stand to promote new products, sales or specials, and upcoming events. Whatever you decide to use it for, a trade show banner stand will help take your advertising to the next level. 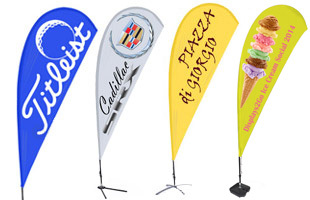 Most of these banner stands come with custom printed graphics printed from your supplied artwork. Your graphics are printed using the highest quality print processes and materials, so you will get the brightest colors and sharpest images possible. Since these banner stands are printed from your artwork, you are free to create whatever your business needs. All of these trade show banner stands are easy to use products that set up easy and come with travel bags for portability. 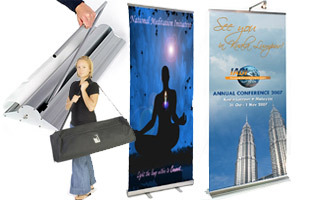 We sell trade show banner stands for every need and function. 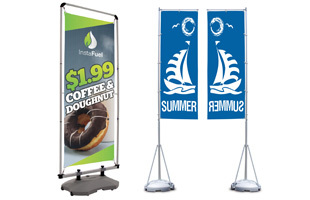 Retractable banner stands are among the most common and popular type of banner displays. These trade show banner stands are great for traveling because they retract back into their casing during transportation and travel. This also protects your graphics from being damaged when you aren't using them. Our hook & loop-receptive banner stands are also quite popular because they allow you to customize your display with an combination of sign holders, literature pockets or other accessories using simple touch fasteners. 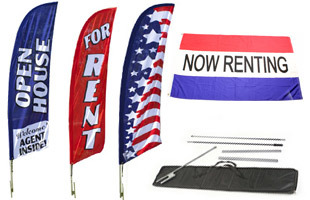 For outdoor trade shows, restaurants or businesses, we offer a wide variety of outdoor banner stands and advertising flags. These banner displays are designed to withstand adverse wind and weather, yet are equally impressive indoors as well. Standing up to 17 feet tall, our giant banner poles are also quick to grab attention, while hanging banners utilize air space to advertise your products. 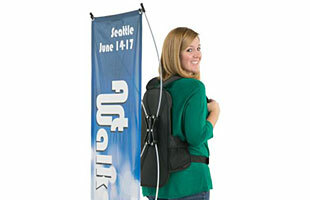 In addition to these trade show banner stands, we also sell a variety of accessories designed to enhance your displays. 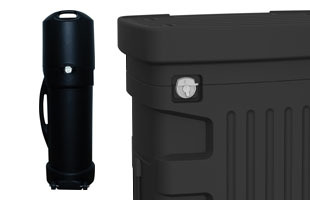 We offer banner stand lights, extra cassettes, travel cases, and more. 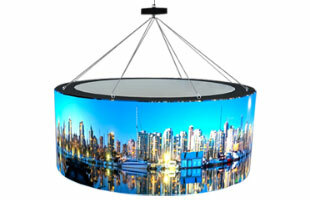 We sell hundreds of trade show banner stands that are always in stock and ready for your artwork! 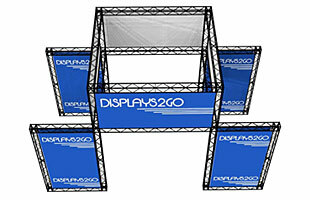 Displays2go is one stop shopping for all of your retail, trade show, and point of purchase needs. We supply thousands of products including ballot boxes, banner displays, sign holders, lecterns, stanchions, trade show displays and literature stands. Over 2,000,000 products are in stock and ready to ship to you. We have been manufacturing and shipping displays products since 1974 and continue to add new products daily!! Orders can be easily placed from our website or over the phone. Our staff is waiting for your order. In addition, our design sales team can quote and prototype your custom sample requests in hours not days. Browse our massive selection to find the right solution for enhancing any point of purchase promotion!